Dunstan St Omer loves women. Remarkably for a West Indian male, his interest is entirely chaste. His favourite is the Virgin Mary. As an artist, he has paid homage to her in countless different paintings, where she always appears cradling her son, Jesus. Madonnas are his forte. His best have been eagerly pounced on by private collectors from all over the world. 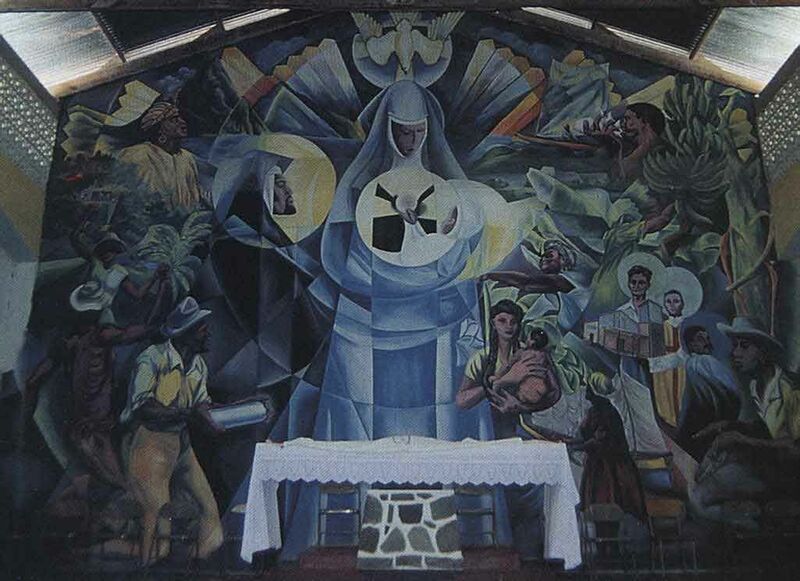 One of the most impressive is his Banana Madonna, where the figures of Mary and Jesus are created from banana leaves: the whole painting is done in white and shades of blue. Before he paints, St Omer prays: “You know that of myself I can accomplish nothing, but with Your Grace I can accomplish everything.” Once a work is complete, it is dedicated to Mary, whether she is the subject or not. 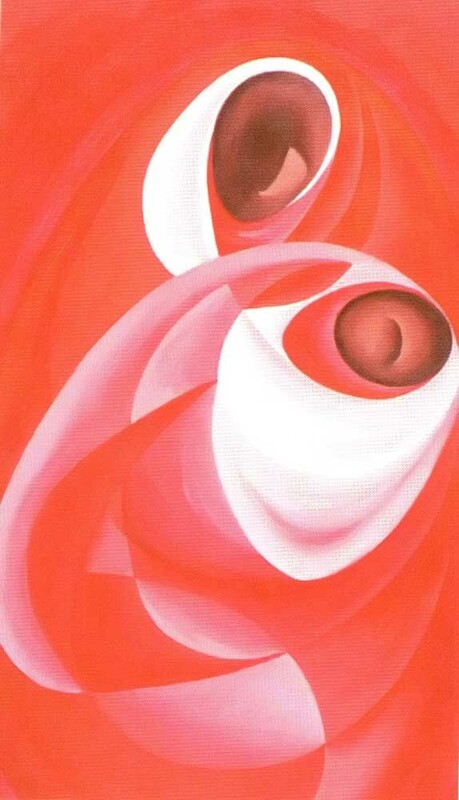 Before every signature on his canvases are the letters PLSV – Pour La Sainte Vierge. That close connection between art, religion and life has led St Omer’s painting in unusual directions. 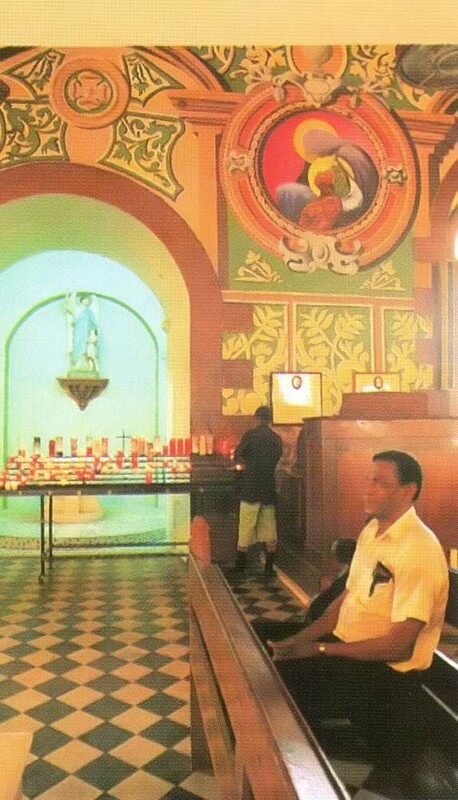 He has painted several altarpieces for the Catholic churches of his native St Lucia: his favourite is the altarpiece of the Jacmel church near Marigot Bay, which he calls his “magic church”. And they are altar-pieces with a difference. 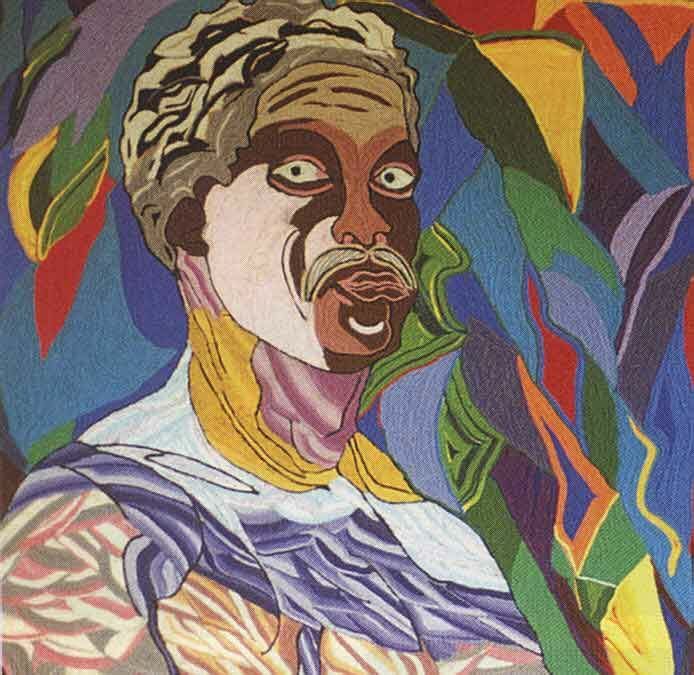 At Jacmel, St Omer painted many well-known local personalities and village figures into the work, giving it a sense of immediacy and realness that is still exciting; islanders seeing the piece for the first time invariably know most of the people in it. 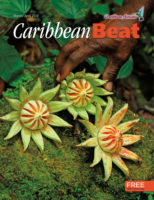 There was no tradition of Caribbean religious art to draw on: the tradition was European. Jesus, Mary and the saints had European features; there was nothing remotely resembling Caribbean faces or tones. 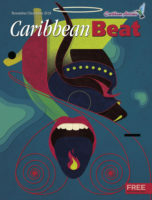 For St Omer, as for so many other Caribbean artists of his generation, the challenge was to reinterpret and reinvent tradition to take account of Caribbean reality. After a long process of internal questioning and dialogue, he saw how this could be done; it was a sort of personal liberation. His first opportunity to test his new approach came when he was asked to paint the wall behind the altar of the Jacmel church. He stared at the blank space; the frustrations and revelations of many years seemed to come into focus. He picked up his brush and began what was to become one of his major works. The new mural was unveiled on Easter morning. Dunstan sat at the side of the church, nervously watching reactions. 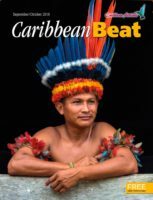 On the wall was the Holy Family, depicted as black, surrounded by the circle of life, which expanded to include members of the community: a chanteur, dancers, a chak-chak band, an Amerindian woman and child, a banana worker, the artist himself. Rays of light shone from a small loaf of bread held by the Christ child, reaching all the villagers portrayed in the painting. To the people watching, it suddenly seemed as if the church belonged to them. 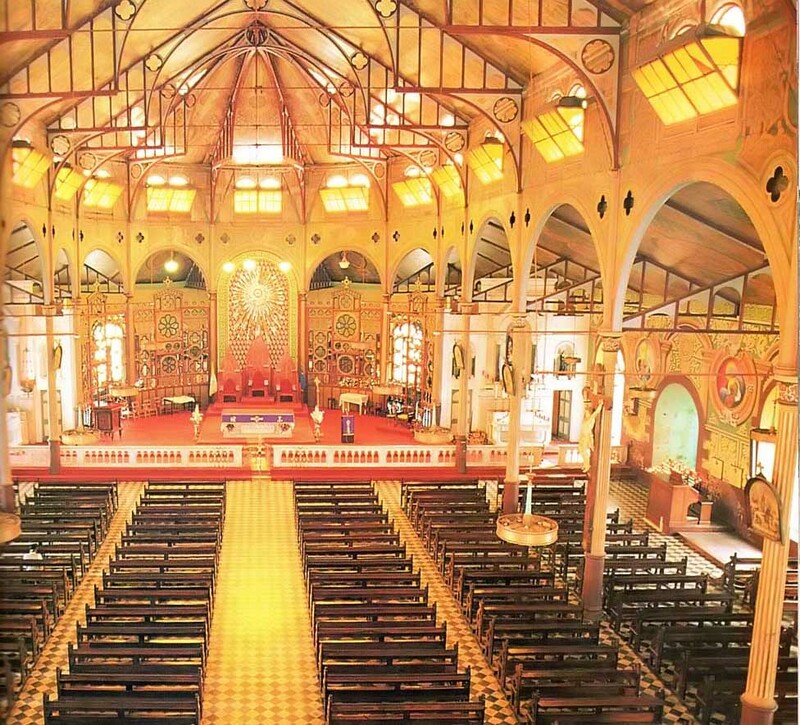 St Omer’s most substantial work is in the Cathedral of the Immaculate Conception in Castries, St Lucia’s capital. This was not just an altarpiece: he was asked to renovate the entire Cathedral. The British Broadcasting Corporation scheduled a film crew for what someone called the “greatest commission since Michelangelo”. It was a challenge that suited the artist to perfection. But the project collapsed from a lack of funds. That was in the late 1970s. 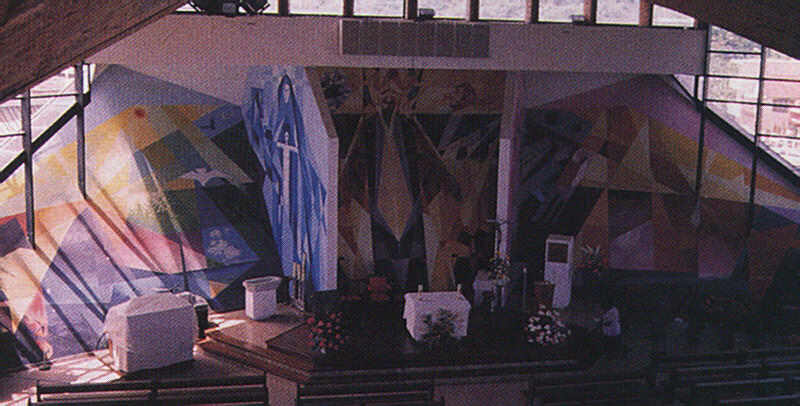 Then, a mere three months before Pope John Paul II’s visit to St Lucia in 1985, the dilapidation of the cathedral shamed the authorities into reviving the scheme; an eleventh-hour decision was made to “give it to St Omer.” The artist (helped by his children) transformed the interior of the big church in just eleven weeks. 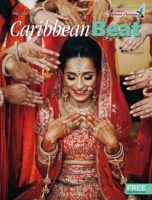 “I placed the first black icons on the walls with the European saints painted on the ceiling by a French artist in 1904,” he recalls again, that insistence on placing Caribbean realities at the centre of an inherited tradition of religious art. 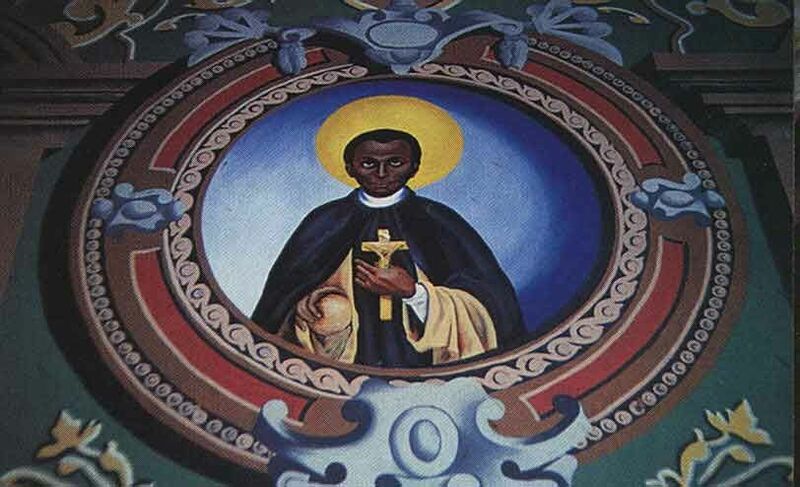 He depicted people with whom St Lucians could identify: the sisters of St Joseph of Cluny, for their work in education; St Martin de Porres, the first black saint; the martyrs of Uganda. The first thing the Pope noticed in the cathedral was St Omer’s paintings; since then, thousands of visitors have been to the cathedral just to see his work. Two years later he was recommended to the parish of François in Martinique. The town’s old church had been destroyed by fire, and the new building was unadorned. He took three months to complete what he calls his “greatest prismatic work” (the reference is to the style he developed with Nobel laureate Derek Walcott when they studied cubism together in the 1950s). Its immensity suits the modern design of the building perfectly. St Omer portrayed the Life of Christ, from birth to crucifixion: the last scene depicts Armageddon. Despite his intense religious feeling, St Omer gives no suggestion of cloistered piety. 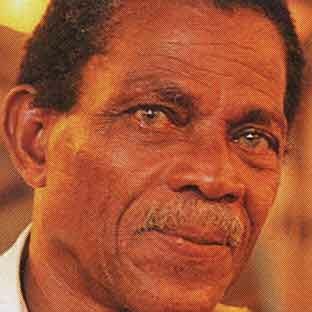 A tall, solidly built man with startling green eyes and a St Lucian accent underlaid with English tones – a relic of his school days – he has an immense laugh, almost a shout, and an easy flowing sense of humour. 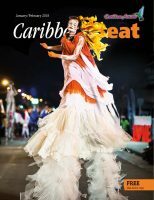 He works for the St Lucian government as Curriculum Officer for Art in the Ministry of Education and Culture. His office, a small ill-lit concrete cubicle stacked with finished, half-finished and abandoned canvases, is on the ground floor of an old government building opposite the Castries courthouse and Registry. Its location makes the office a target for every city vagrant. During the week, they take turns knocking at the door to ask “what de mister have for me today?” St Omer knows all of them by name and can even tell who is at the door from a footfall or a knuckle rap on the glass pane of the door. He keeps a ready store of dollar coins so that no-one goes away empty-handed. He was raised in a Catholic household. His father, a customs officer, made great sacrifices to send him to St Mary’s College, the finest secondary school on the island. “There was one island scholarship every two years, and you could only dream about going to university,” he remembers. 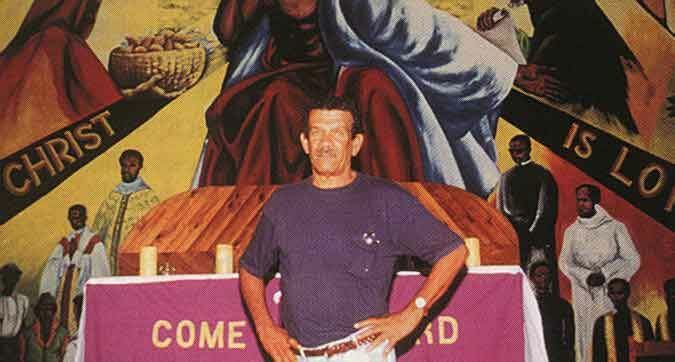 At St Mary’s he met fellow St Lucian Derek Walcott (whose poetry and plays were to win him the 1992 Nobel Prize for Literature) and the two soon became close friends, both influenced by Simmons. Walcott also happened to be a talented watercolour painter. They worked together and developed a strong professional bond, as some of Walcott’s poetry would later acknowledge: St Omer features as Gregorias, the black Greek “animated by his own fire” in Walcott’s long autobiographical poem Another Life. 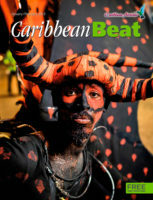 In his late teens he went to Curaçao to work in an oil refinery. Here he bought his first box of oilpaints and met a local artist named Pandellis who invited him to work in his studio on weekends. 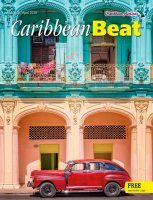 He returned to St Lucia in 1950 and dedicated himself to a life of art, the most precarious career he could possibly choose. He felt that he had no choice. “Art chose me, he says, adding that it was God’s will that he paint. Money was invariably short, and at one point, St Omer, close to despair, turned to alcohol to ease his misery. “It was a most traumatic period. I was a young man trying to be an artist, a Roman Catholic, married, with lots of children to raise properly in a community that could not support an artist. It was absolutely impossible.” One of his children came home from school one day and said that friends were calling him a drunk. He stopped drinking immediately and reaffirmed his devotion to God. He does not touch liquor today. 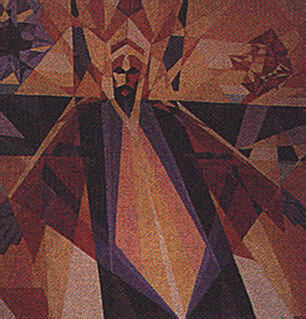 he completed his largest mural, at the International Centre for Students. 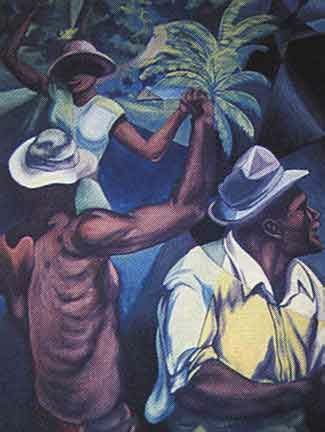 He had already done several commissions at home, and in Puerto Rico often found himself teaching classes. 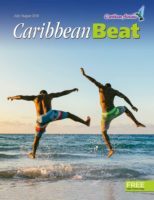 Recently he has been doing St Lucian landscapes, using nothing but a palette knife to create bold, impressionist strokes. Several canvases have been bought by Project Helen, a St Lucia National Trust programme to establish an art collection by local painters. Before starting, St Omer walked miles of the island’s coastline in search of the images he wanted. New work is also plastered along a quarter mile of sea wall in the village of Anse La Raye, a collaborative effort between St Omer and his sons and part of the village’s beautification project. St Omer never taught his children to paint: he says that he wanted to spare them his suffering. 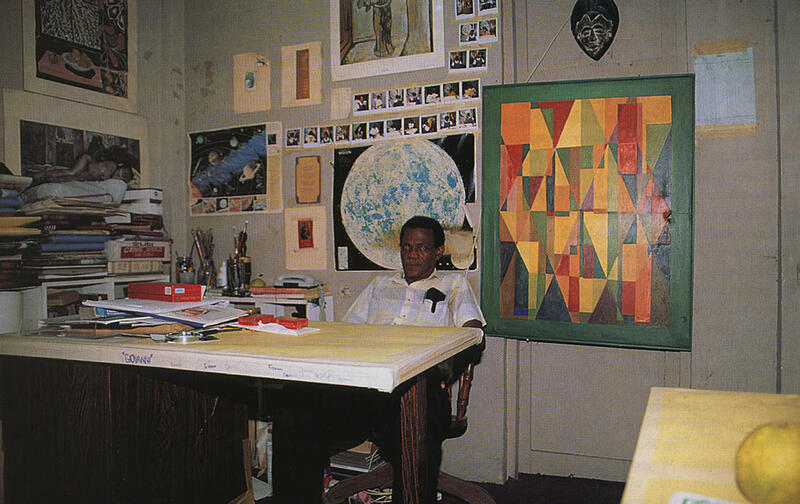 “I was not going to encourage any child of mine to become an artist.” But each of his four sons has become a painter. It seemed to them that their father was paving the way for them.